The American Water Spaniel is an intermediate breed between true spaniels and retrievers. It is most commonly used while hunting from a canoe or small boat, from which it will leap out of to retrieve drowned waterfowl. It will also retrieve from land and flush as needed. 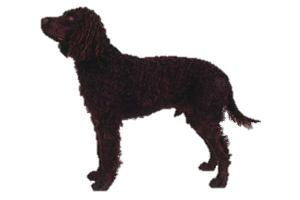 The American Water Spaniel is believed to have developed in the Fox and Wolf River valleys of Wisconsin, although it was also popular in Michigan and Minnesota. It is unknown which breeds were used in its creation, guesses include the now extinct English Water Spaniel, Irish Water Spaniel, Curly Coated Retriever, Field Spaniel and Poodle. It is known to have existed since at least the 1860s and was further refined by Dr. F.J. Pfeifer in the 1920s. Despite this refinement it continued to be outshadowed by imported breeds and at different times in its history has been near extinction, but fanciers of the breed continue to manage to maintain the population. Is the American Water Spaniel Right for You?